Since Ava came into our lives, I have become even more aware and concerned about what we are putting in our stomachs and calling food. We are limiting our intake of red meat and when we do serve up some steaks, we make sure they come from a farm [usually local] that practices responsible and sustainable farming for the least impact on the environment and our bodies. We also try our best to purchase organic produce and prefer local, but especially in the winter months, that can be difficult. Then I did a search for local produce delivery and farmers markets and came across more options than I imagined. [If you are not in the Chicago area, I suggest doing your own search to see what’s available to you … and I would love to hear about your own local organic groceries and markets!] Our family will be trying each one out over the next couple of months and I’ll be sure to let you know about our experiences. Irv and Shelly’s Fresh Picks. Chicago residents and parents of two, Irv & Shelly, started this year round local delivery service to help local independent farmers prosper by bringing fresh, chemical free, and delicious food directly into our homes. In addition to seasonal produce boxes, you can also make a la carte selections from an assortment of fruits, vegetables, meat, dairy, eggs, and more. We recently tried this service out and were very pleased. We chose a double box of veggies for $25 [which included lettuce, radishes, scallions, potatoes, tomatoes, an eggplant, marinara sauce, a green pepper, and some mushroom patties], a few apples, some bok choy, whole wheat flour, blueberries, and tofu. The delivery guy was super friendly and took the time to explain the drop off process to me and when I realized our mushroom patties had been left out, they were quick to get back to me and offer to drop them in our next order or give us a refund. So far, we have only used the potatoes, scallions, and lettuce and they were delicious. Newleaf Natural Grocery. Strong advocates of supporting local farms, this grocery stocks their shelves with as many local goods as they can get their hands on. They offer a variety of grass fed meats, fresh produce, fair trade coffee and bulk foods, and a hefty raw foods selection. They offer six different box varieties for pick-up or delivery and this is next on our list to try! Located at 1261 W. Loyola Ave.
Natural Direct. 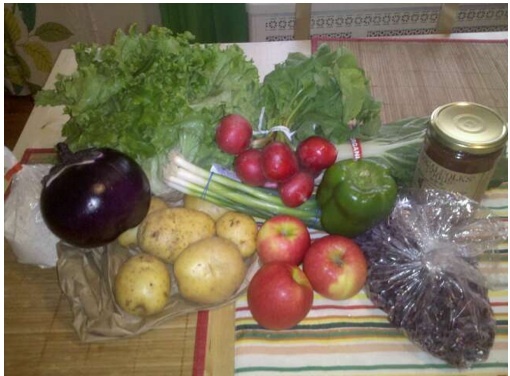 This grocery service serves the greater Chicago area and seems to have the largest selection of locally grown and organic foods that you can have delivered to your door. You can customize your own order or choose one of their weekly boxes [they even have a grass-fed meat box!]. The site is easy to navigate and there is a pretty substantial list of grocery items in addition to the meat, produce, dairy, etc. I’ll give you more details after we try it out. Green Grocer Chicago. Although as far as I can tell, they don’t deliver, Green Grocer does have a produce box subscription. There are two sizes available [$15 / $28] and you get a mix of local and organic veggies and fruits that you can pick up at their store every Wednesday. I have yet to visit the store, but from what I hear they have a great selection. I’m going to try to check it out sometime this week. Located at 1402 W. Grand Ave.
Green City Market. This farmers market in Lincoln Park is the city’s most popular destination for local farm shopping. During the winter months, you can visit it indoors at the Peggy Notebart Museum and the next date is February 13th [meat & potatoes]. There is no option for delivery, but it’s worth the trip and you get to meet some of the farmers and sample the goods and there is always some treat you didn’t expect to find – like chef demonstrations and little festivals. Check out their site for a calendar of events. And while I was looking into all of these local food sources, I came a cross The Local Beet – a site full of forums and blog posts all about “a practical approach to local eating”. Check it out!! !